Doing all that reviewing of online image editing software really got me thinking about what else can we do with all those neat images once we’ve done massive editing and reworking of them? So, I decided to look into some of the many online photo storage sites, several of which I already belong to, and write a quick review of some of my personal favorites! Redbubble is an astonishingly complete site for uploading and organizing your images, and it has a whole lot more to offer than most of the others, that’s why I’ve decided to review the “very best” right off the bat instead of saving it for last! This site is a relative newcomer to the Net, only being around for about a year. Even so, it is such a powerful site and community, that it earned itself a honorable mention from the much coveted Webby Awards! It deserves the recognition, believe me. At this site, you can pretty much upload your entire catalog or repertoire of large images for free, and that’s only the beginning! What’s great and amazing about Redbubble is that it is a veritable “United Nations” of photographers, fine artists and writers. Everyone there has the ability to create their own personal page or “gallery” full of their work, whether it is art or prose, you have a place to do your thing for absolutely free. What else is fantastic about the “Bubble” is that you have the opportunity to actually sell your work, seriously! You can choose several different format options for your art and sell it as prints, greeting cards, or posters, whatever you want! Heck, you can even design and sell T-shirts of your art work. How cool is that? 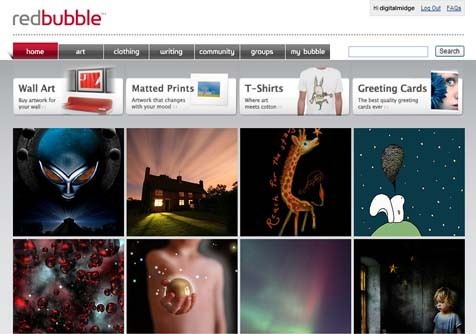 Both the management and members at Redbubble host tons of interesting groups that you can join and participate in within the site. Lots of fun contests are running most of the time, and you can even be honored by having a piece of your artwork ‘exhibited’ on their front page. Lots to do all the time… you can never, ever get bored on the Bubble! Another wonderful aspect of the Bubble, and perhaps my favorite of all, is the ability to meet people across the globe from Australia to America, England to Dubai, or Portugal to Canada, it doesn’t matter about the time differences, people will just gravitate toward each other, and have an opportunity to network with other like-minded artists and creative people. You can also comment and critique others’ works, and have your own work critiqued by your peers and friends. It’s just a wonderful place to go and find others like you, and have a great time talking to many diverse peoples all over this big Bubble we call Earth. I absolutely can’t say enough about this site, it’s really a ‘home away from home’ inside my computer! This online cybercafé, art gallery and community gets the absolute most rousing, foot stomping, Bic-flicking standing ovation from me ever! 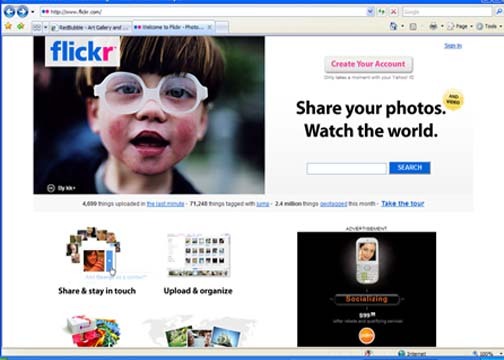 Flickr is a neat little photo and image storage site that allows you to login to it using your Yahoo email address since it’s a Yahoo company. What I like about Flickr is that it allows you to connect a little photo slideshow to your blog at Blogspot.com should you have one of those blogs like I do. It is a nice little place to do some very limited photo editing, and it has a nice drag and drop feature to allow you some batch processing say you want to resize a bunch of images from your ‘photo album’ on Flickr. One issue I have with Flickr is that it only allows you to upload 100 MB worth of your images per month, that is if you don’t have a premium account that costs about $25 bucks per year. This is probably okay with most people, but I’m one of those folks with tons and tons of huge images, so this site isn’t probably as flexible as I need it to be for my own needs, but it is a nice site and worth a look! Flickr gets a big round of applause from me for its ease of use and uploading, and for its little slideshow feature! York Photo is a wonderful site for all things image-related. What I like about York is it reminds me of an old style photo lab in that it allows you to upload you images and then order prints of them quick as a flash. 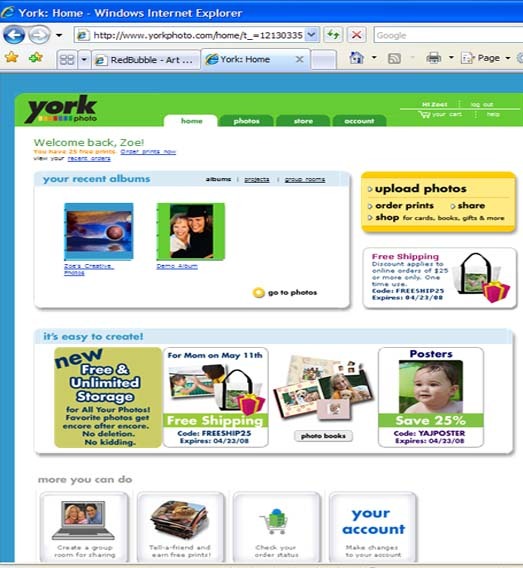 Their offers and deals are unbeatable if you want to upload tons of your hi-res images and then have copies sent to you for very cheap or free, that’s right, York gives you so many freebies just for signing up. I am on my second round of “25 free prints”, which is fantastic in my view! This site also lets you have some flexibility in creating gifts out of your photos like mugs and mouse pads, T-shirts and greeting cards, and their prices are competitive. But wait! They even offer free shipping on lots of your orders, so they’ve definitely got my attention. This site gives you unlimited upload and storage capability, and the best part of all: Their printing is superior. I received some free copies of some of my uploaded images the other day, and the prints were just spotless and brilliant. They aren’t too bad with turnaround time either, and if they should falter and take a bit too much time getting your prints to you due to their high order volume, they e-mail you, and reward you by adding more freebies to your account. Everyone would be well served to sign up at York, it is well worth going there to check it out! York gets a rousing ovation from me for their great service! Snapfish is a very nice photo storage program that is owned and run by Hewlett-Packard (HP), so you can bet that the quality is there, and is something worth looking into. This site offers you cheap prints for around 0.9 cents each, which is nice, and also gives you a sign up bonus of 20 free prints. When you login to Snapfish you’ll notice the GUI is very similar to York Photo, and they also use the same FTP, so it’s six of one and half a dozen of the other, but nice and easy just the same. Snapfish has also been around for quite a number of years, as has York, and I believe you’ll enjoy using both of them. You can never have too many photo upload sites bookmarked on your computer! 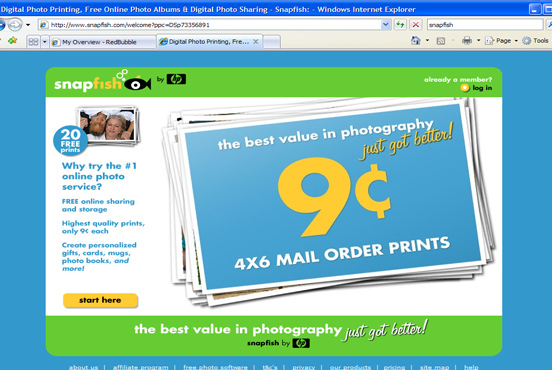 Snapfish gets a very warm round of applause for their nice upload site. I must say I am very impressed with the quality, upload speed and ease of use of all four of the sites I have reviewed in this article, and I am confident there is something for everyone on any of these sites. Another plus for having your images uploaded to any one of the sites I’ve reviewed above is that you can copy and paste the link from your photo directly into your blog or websites, and then viewers can see your photo without it physically being located where your sites or blogs are. Very convenient! Whatever your needs are with regard to digital image processing, from storing large amounts of high-resolution images to printing copies of your photos, and even networking with a bunch of fantastic, like-minded, artistic individuals like yourself, it is definitely worth a few minutes of your time to go and visit these sites and have a look around!